AQ Smart Speaker offers wire-free Apple AirPlay | What Hi-Fi? AQ Audio has launched a completely wire-free, portable Apple AirPlay speaker. The AQ Smart Speaker with Apple AirPlay works with any iOS device and can work on its own, in a stereo pair or even as a multiroom system. 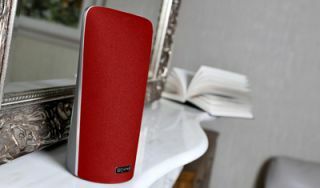 The speaker has a long life rechargeable battery, claiming 10 hours of sound in AirPlay mode or 30 hours if playing a device connected via the line input. As well as a 24-watt digital amplifier and twin drivers, each speaker has AQ Audio's 'ALLROOM technology', which aims to better disperse sound around your room. If you play music from iTunes you can set two speakers to work together as a stereo pair, or use Apple's Remote app to control more than one in a basic multiroom system. Available in a choice of finishes, the AQ Audio Smart Speaker is out in December and will cost £220.